Skulboy Designs: Exciting news from MVP! Some exciting Skulboy Designs news from MVP Disc Sports! Very much looking forward to continuing the Skulboy/MVP custom stamps directly from the amazing MVP Team. "Introducing the Skulboy Orbital, in stores September 4th. 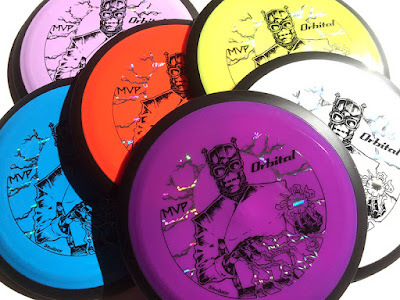 We're pleased to welcome Skulboy Designs for his first factory-direct MVP model stamp, the limited edition Skulboy Orbital. This dual foil stamp design continues Skulboy's series depicting the Doc Volt character. All discs are Neutron Orbital with black and silver holographic foils. This is a collectible limited edition of 1,000 discs. In the past Skulboy stamps have been available only through a third party stamper. Moving forward we anticipate offering new Skulboy MVP model stamps -- now our dealers can get in on these collectibles at a great price!"